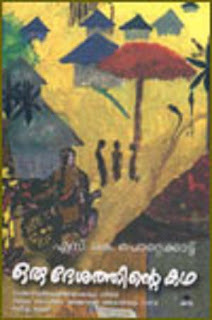 This book is a travelogue well written by the 54 year old author Hari Singhani. Hari Singhani has narrated a wonderful journey by road of about 4300 kilometers on his Enfield motor cycle all alone. He has started from Pune in south India and travelled to Kashmir with halts at Dahanu, Ahmedabad, Mt. Abu, Jaipur, New Delhi, Kiratpur, Kasol, Manali, Darcha, Pang, Leh, Hunder, Leh, Dras, Srinagar, Patnitop and Jammu. From Jammu he has returned home to Pune by train. The narration of his journey beyond Manali is very good and adventurous. He has given a clear picture of the areas in Himalayas which many of us can never see. His description of the snow clad areas, the high altitude passes, glacier melt nalhas , the tented accommodation etc., will make all us to feel as if we are ourselves on the move. He describes about his accommodation at Darcha after Manali and Rohtang La as a circular tent, which looks large enough to house two cricket teams. He counts a total of 40 metal beds ( with mattresses and thick quilts on each ) placed in rows seperated by a foot-wide aisles on either side.The hotel is operated by a tibetan couple whose own space is cordoned off from the guest beds by a curtain of some more thick brown canvas. The menu at almost all the places in the Himalayas tented accommodation is dal rice combo.Enroute such tented accommodation is available. Through out the Himalayas ( ofcourse from Pune itself ) the author rode the motor bike alone even without any pinion rider. At most of the route even without any phone connection. On the way to Leh the capitol of Ladakh he passes Tanglang La ( 5360 metres ) the second highest motorable road. The author explains that the atmosphere suddenly changes by minute and some times a high dust storm also happens. The roads are too narrow and once it took him more than an hour ride to overtake a convoy of military vehicles. He says that lot of tourists from around the world are there at Leh. Hotels are there . But the cost is too high at around Rs.3000-00 per day. The author has visited many places in Srinagar , Jammu, Kargil. He narrates the difficult , lonely life of the army personnel who are guarding our boundaries sacrificing their present for our future. This is a great book and a very worthwhile to read. The author shares many thoughts on biking and of lifestyle in various regions of India as well as elsewhere. You won't regret buying this book thus commented one reader from Spain. Now here's a brilliantly talented writer who, with no great prior preparedness, has the guts & gumption to bike across from one end of the country, ready to deal with situations as they emerge and tell us things we rarely hear about this wonderful land called India. One life to ride is a marvellous book. thus commented another reader. This is a wonderful book which will create interest the regular traveller and makes others to get interest in travel. This book makes us feel to travel Himalayas by road. If not on a bike alone but with friends on a car. There are lot of travel agencies in Delhi to cater to our needs. Though I am over 61 years I am planning to go this summer.